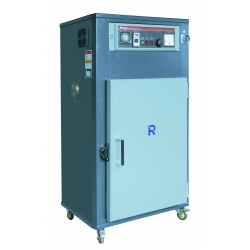 The RCD series of cabinet dryers are mostly used for simutaneous drying of different kinds of polymers in small quantities or for drying material for trial moulding. They can also be applied in electronic engineering, electroplating, pharmacy, paint baking, printing industries and etc.for preheating or drying related products. 1. Accurate P.I.D. temperature control to achieve an even drying effect. 2. 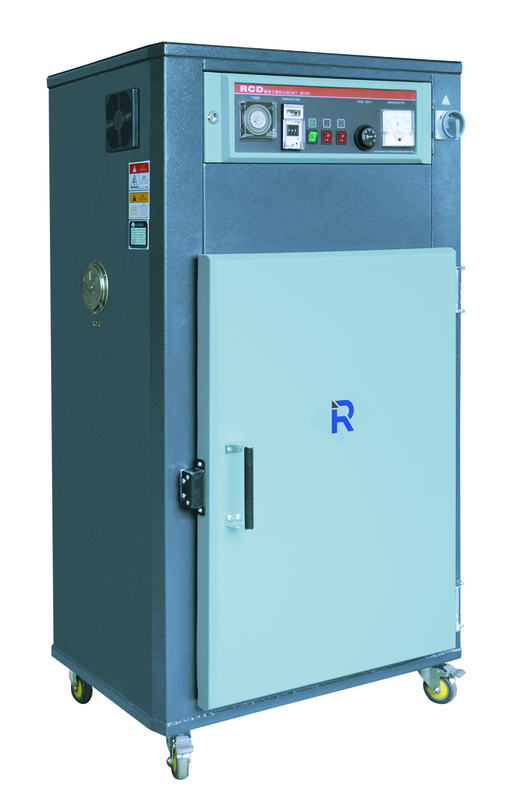 Air tight insulating door can maintain temperature constantly inside to reduce energy consumption. 3. Stainless steel tray and liner bring no contamination to materials. 4. Optimal design for easy maintenance and service. 5. Unique-designed adjustable air inlet and exhaust. 6. Overheat protector can prevent excessive drying. 8. 24-hour timer, easy to operate. 9. Visible alarm to indicate emergency trouble. 10. Tray size and inner dimensions of the dryer can be specified according to requirements.